It has been raining here constantly, and the windows froth up, a delicious condensation that leaves everything outside blurry, out of focus. I must admit, it has certainly made the air thick with nostalgia, one that emerges but fleetingly, seeking out an image with which to realise itself. I saw a photograph the other day that reminded me of you, ladies in a square: mouths gasping open, a fist raised. It is a clear, bright day in Montevideo, and they are at a protest. The details are unclear, for all we know about the image, and the women in them, are a set of keywords: Bus; Plaza Independencia; Protest; Sign; Social Conflict; Speaker; Square; Woman. 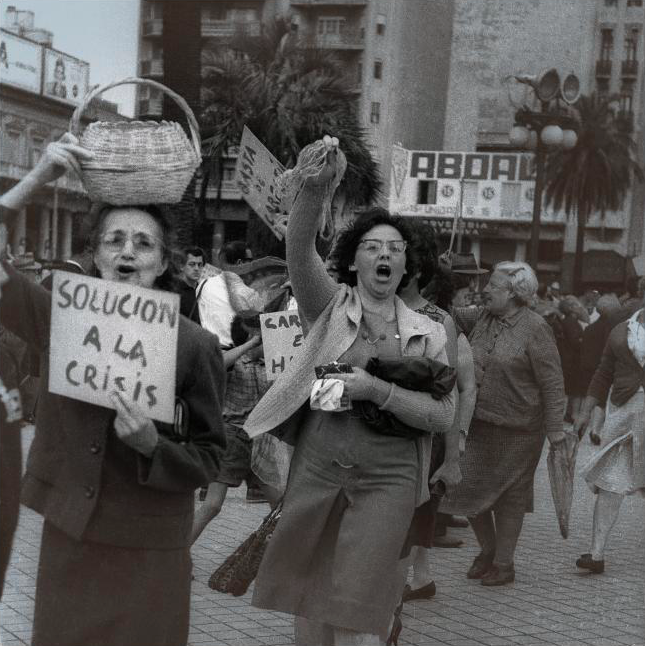 One of the women, older, carries an empty basket on top of her head, fingers held at the perfect angle; in her other hand she holds a sign, Solucion a la Crisis spelled out in hand-painted letters. Yes, these women radiate a certain strength, which splays across the surface of the image. And I think about what it means to be a woman at a revolutionary moment, where does their agency unfold, what are the words that take shape in their mouths? I think of you, as a young brown girl growing up in apartheid, and I wonder, did you ever raise your little fist? This image, along with 40,000 others, was lost for a while. Stuffed into a canister, negatives rolled up and hidden in a dark, damp place. Until they were found, decades later and now, here, in front of me in London. I’ve been going over a phrase ever since I first read it, too hungry for history, how perfectly it rolls off the tongue. It is, writes Milton Santos, when a young nation speeds ahead without a thought to preserve its past, a result of the neoliberal logic of always having to move forward, toward a certain progress. Does this seem familiar to you too? I fear our country does the same, taking me back to my recent time in Delhi, walking through the remains of Jantar Mantar, outraged by how these pieces of our history have been treated so recklessly; dirty and stained, the result of ill repair. I must explain of course, of how I encountered this image, and how the room where I found it, dark and lit solely by whirring projectors, suited so well my current sympathy for the nostalgic. The image shimmered, you see, as though it were soaked through, its surface a pool of light. I was fortunate enough to be alone in the room, to choose as I did, which switch to flip, in which direction to tilt my head. An old projector cast the image onto a wall, and there it was, glimmering before me, an apparition. I was careful not to step too close, as though if I were to whisper over it, or graze it by chance, it would quickly disappear. Inside of the machine, was the image’s diametric opposite, a small slide as big as my thumb. And on that slide, little tears and the image peeling off in places and in others, discoloured. ‘This is like memory’, says the artist about the installation. You don’t have to work too hard; she has made it easy for you. Music boxes tinker, and their soft eerie sound bounces across the walls. There are several other images like this one, each a memory mediated by a machine and its steady burn. And just like real memory, these images, full of holes, dissolve. Perhaps history works in the same way, where you can’t blink too hard, or hasten your approach, just let it glimmer before you in a dull haze. Being as I was in a gallery, I wondered about how when the state and its institutions fail, it is art that takes on the burden of politics, and in this case, the showcasing of history. Each image a bubbling up of that history, that politics, a bursting to surface. A project like this halts the obsessive acceleration toward the future, generating a nostalgia that allows us to step sideways, rather than forward or back. Sideways to resist the linear arc of time, sideways to take a moment, and watch a forgotten image burn before your eyes. I want you to know, that I think of you often grandmother, and how, like these women, your strength shimmers before me, an apparition. Skye Arundhati Thomas is a writer and editor based in Mumbai, India. This text was commissioned in response to the first major UK solo installation by acclaimed Brazilian artist Rosângela Rennó, held at The Photographers' Gallery February – April 2016, in which the artist presented images from the salvaged archives of photojournalist Aurelio Gonzalez over 20 analogue projectors.